The Friends supports the creation of a memorial on the Common to these two civil rights leaders, and looks forward to continuing to work closely with both the nonprofit and the City. Placing any memorial on the Common, especially one this important, must involve the Mayor's Office, Parks Department, Art Commission, and Landmarks Commission, in their roles of review and permitting for any additions to the Common, as they are now and have been for many years. We want the memorial to be successful, and when completed to enhance the City's civic landscape while promoting racial dialogue and healing. We also need this effort to enhance the Common, and seamlessly fit into a park that serves Boston as the center stage of civic life. 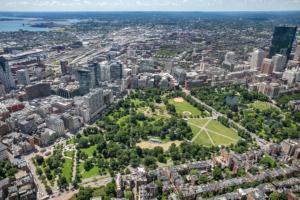 While small in scale (48 acres), the Common is the most heavily used park in the City and the site of hundreds of permitted events as well as the destination of millions of visitors from the neighborhood to the nation and beyond.